Here’s an interesting item. Undated but most like from the mid 1990’s this packet of California poppy seeds is “Planting the Seed for Anaheim’s Future”. This packet looks as if it was actually used, it’s weathered and all the seeds are gone! I’m not familiar with that castle & globe logo, was that supposed to be for Wescot? 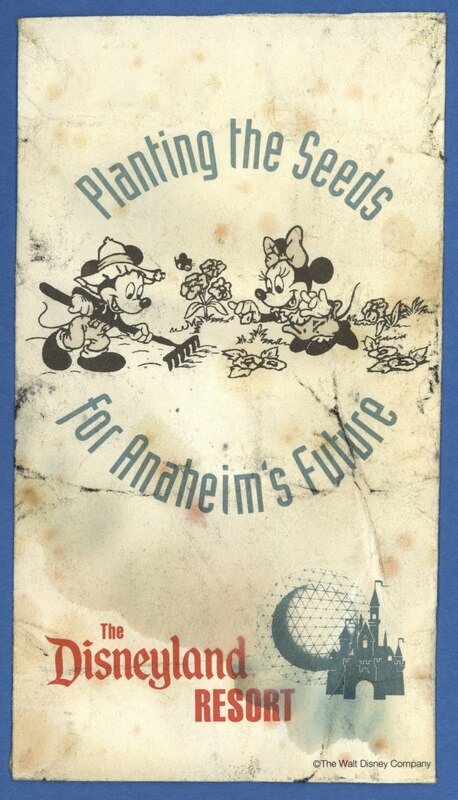 This is probably before the Disney's California Adventure idea was born, yet the instructions appear to describe DCA perfectly; thinly cover with dirt, sunny location preferred and little care or water needed. 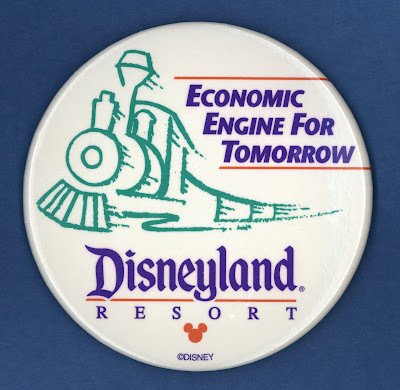 This badge definitely demonstrates what went wrong wit the second park concept, its all about MONEY!!!!! Your commentary on the seeds is hilarious...and sad...all at the same time! At least they are doing a first-class job in repairing the original screw-up. Maybe more seeds to come when DCA is done? Wow, that's fascinating, especially with that little logo! Los Angeles Souvenir Book - 1960?